Dredging for marine minerals in UK waters is an important aspect of meeting the demand for high quality sand and gravel used as aggregate in a wide range of construction projects. In addition to responsibly-quarried land-based aggregates, the UK Government supports the supply of marine-dredged sand and gravel, provided that environmentally acceptable sources can be identified, and utilised, within the principles of sustainable development. 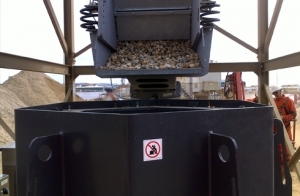 One such source of marine aggregate is landed and processed at Tarmac’s operation at Shoreham in Sussex. The sand and gravel is washed, screened and crushed at the wharf side, creating a valuable commodity for the regional construction industry. 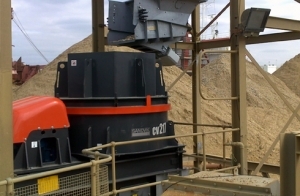 An increasingly important tool for Tarmac is their recent acquisition of a CV217 VSI crusher supplied by Sandvik. Tarmac is the UK’s leading quarrying firm, with sites across the whole of the UK, including a number of marine dredging operations. For Tarmac, this makes it essential that the aggregates they produce are processed efficiently, minimising waste and maximising the use of this valuable and finite resource. When it comes to marine aggregates, this approach is clearly seen at Tarmac’s Shoreham site. Here, marine dredged sand and gravel, essentially ballast with 20-70 per cent sand content, is unloaded from boats to shore. From this unprocessed condition it is washed, screened and crushed in order to produce products for use in the construction industry. The sizes produced in the initial processing consist of: 0-4mm; 2-6mm; 4-10mm; 10-20mm. The 20mm+ material is crushed in a VSI (vertical shaft impactor) crusher in order to add further material suitably sized for use as core products. The problem Tarmac had experienced was that their existing VSI was not able to crush the material at high enough rates of production. Hence, so as to improve the efficiency of the Shoreham operation, Tarmac contacted Sandvik, who were able to recommend the use of a CV217 VSI - one of their new generation of crushers purpose designed for the aggregates industry, and ideal for the processing of sand and gravel. Currently the CV217 is crushing the dredged material at a rate 180tph; however, the VSI is more than capable of operating at production rates in excess of 200tph, with figures of 214tph being reported during commissioning and testing. This improved production from the new generation Sandvik VSI is a significant improvement on Tarmac’s previous VSI which possessed a production rate of 100tph. A major reason for this increase in production is due to the CV217 possessing a 73LP (low profile) energy efficient patented rotor and the ability to process an extra 20% in the patented BI-Flow system. This “extra” 20% in Bi-flow consumes no motor energy, gives no wear to rotor wear parts and maintains the same PSD (particle size distribution) as achieved when operating with rotor only feed material. The impressive of the CV217 enable it to deliver production figures averaging out at 0.86kW per tonne, while still producing the particle size distribution Tarmac require for their production requirements. Furthermore, enhanced economical operation is achieved as the motor on the CV217 is an IE2 energy efficient model, which has produced significant savings with regards to electricity operating costs through its more efficient operation that also produces significantly lower Co2 emissions. Although the CV217 has proved capable of almost doubling production, this has not been the major area for its success. This has been achieved in producing the three core saleable products for the Tarmac Shoreham operation: 0-4mm; 4-10mm; 10-20mm. The new Sandvik CV217 was principally chosen by Tarmac for its ability to crush sand and gravel in order to produce a marketable high quality sand product, of a consistent small size, at high rates of production. The modern design and construction of the crusher produces extra benefits for Tarmac as its 2nd generation rotor and wear parts allows for greater production, but using less power, for a more efficient and environmentally focused operation. Furthermore as it mirrors nature’s action using rock-on-rock action for breakage, the VSI uses fewer parts, meaning a reduction in spare parts need to be bought during the operational life time of the production facility, thereby maximizing Tarmac’s investment. All of these factors mean that Tarmac is able to maximise the dredged sand and gravel, still be able satisfy their customers’ requirements, and operate in a more environmentally focused manner.